MACON, Ill. — After a thrilling season a year ago when Terry Reed held off Bobby Beiler for the Big Ten Series Street Stocks championship, Macon Speedway hosts five nights in the 10-race series in the 2015 season. A highly competitive series with a large car count last season, the street stocks are expected to bring the fans to their feet once again this season. 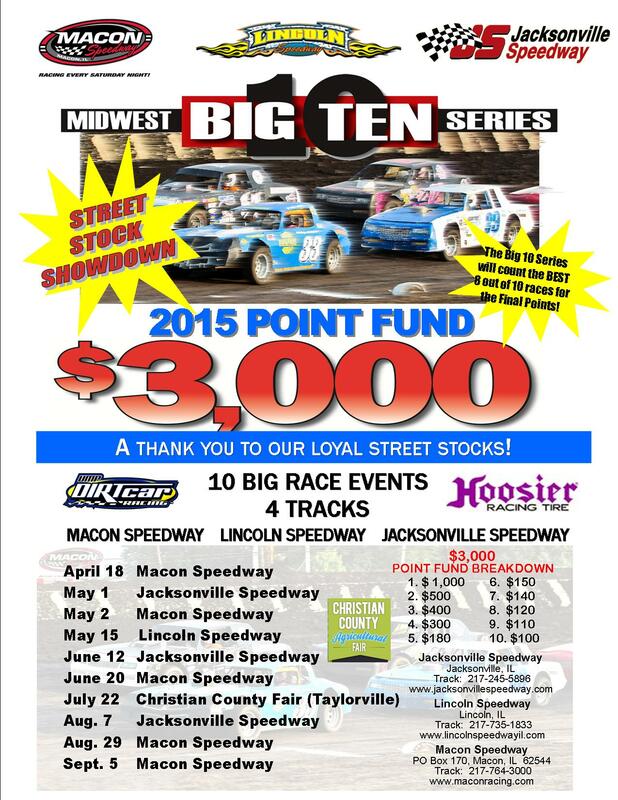 The Big Ten Series pays $1,000 to the champion from a $3,000 points fund with races also held at Jacksonville (Ill.) Speedway, Lincoln (Ill.) Speedway and Quincy (Ill.) Raceways. The series also makes a return trip to the Christian County Fair in Taylorville. Macon Speedway drivers dominated the standings a year ago, and local fans are ready to see if their favorite dirt track pilots can defend the track’s honor again this season. Reed, of Decatur, grabbed the title on the final night last season when Beiler, of Blue Mound, had a difficult night. The standings are determined by compiling a driver’s top eight finishes among the 10-race series. The series runs on the Macon Speedway season opener on April 18. The final race is Sept. 5 at Macon Speedway, where the street stocks love to trade paint on the classic fifth-mile high-banked dirt oval. For more infomation, follow Macon Speedway online (www.maconracing.com), Facebook (www.facebook.com/maconracing) and Twitter (@maconspeedway). It’s easy to join the Macon Speedway text service. Fans can text MSFANS to 74574 to receive all fan info. Drivers can text MSDRIVERS to 72574 to get driver updates. Message and data rates may apply. Updates are also available by calling Macon Speedway at 217-764-3000. Macon Speedway is located nine miles south of Decatur on U.S. 51, then 0.6 miles west on Andrews Street and south to 205 N. Wiles.